Should I Divorce? - Look before you leap. Deciding On Divorce - Making the hard decision. Ending A Marriage - Knowing when it's time to leave a bad marriage. Should I stay or should I go? - Answers from the life coach. When Is It Time To Go? - Should you go your separate ways or give your marriage another chance? Reasons For Divorce - What causes a marriage to fail is often a lot more complex that the legal grounds stated in the divorce. A Divorce Perspective – When giving up on Happily Ever After is the best thing to do. Should I Get A Divorce - More articles to help you decide whether to stay or go. Dirty Divorce Tricks - Seeking revenge through your divorce can backfire. Find out what to avoid. I Don't Want A Divorce - What to do when it's dumped on your lap. When to Get a Divorce - Examining the core issues. Should You Reconcile - Dealing with the doubt. Divorce Reconciliation - Answers from the life coach. The 5 Stages of Divorce - Divorce consists of several stages: Cognitive, emotional, physical, legal and spiritual. Learn why it's important to work through all the stages. The Emotional Stages of Divorce - What to expect. Your Emotions After Divorce - The range of emotions after divorce varies greatly. Learn what to expect the first 3 years. Dealing with Emotional Pain - Feeling despair and devastation is normal after a divorce. By allowing yourself to feel the raw pain of your loss, you can begin to let go of what was and move on with your life. Divorce and Depression - Do you feel like you’re struggling after divorce and depression is holding you back? These tips on how to deal with depression after divorce can help. How To Survive A Divorce - Developing the right mindset. Divorce Is Not the End, It's a New Beginning - The heartbreak and loss you’re experiencing can make it hard to see this stage in your life as an opportunity for transformation and growth. Divorce doesn't mean you're a Failure - The importance of not letting negative emotions get the best of you. Tips to Get over Your Ex - If you're obsessed with what your ex is doing and can't get past continual thoughts of him, these ideas can help jump-start the healing process. When Your Ex Gets A Girlfriend - Coping when you have kids. 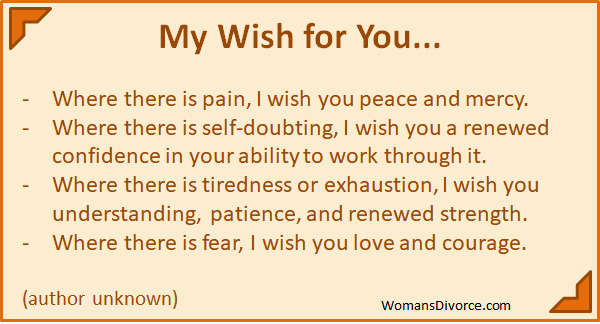 Advice for the Newly Divorced from other women who have been in your shoes. How Men Handle Divorce and what to do if he goes nuts when you tell him you want to leave. For Stay At Home Moms - Tips for getting through divorce. Being Strong for Your Kids means putting everything in perspective for their sake. Your Perspective On Divorce - How to move beyond seeing yourself as a victim. Divorce And Guilt - Is it normal to question if you made the right decision or feel regret later on? Regretting Divorce? - What to do about your doubts. Facing Your Fears - How to move beyond your fear so that you can begin really living your life to the fullest. Accepting Divorce and moving forward with your life as it is now. How To Cope With Divorce - Dealing with change. How To Deal With Divorce and all the emotions that go with it. How to Deal with The Pain of Divorce - Coping strategies. How a Family Counselor Can Help - Family therapy can help families and their member weather the storms of divorce and more. Your First Christmas After Divorce - Tips for dealing with the nostalgia and sense of loss. Real Marriage vs. Wedding Vows - Here is an insightful look into how traditional wedding vows have a hard time holding up in real life. Does God Forgive Divorce - A Christian point of view. Divorce and the Bible - Are all marriages blessed by God? Dealing with friends and family - Advice from the life coach. Depression from divorce - Coping strategies to get you through. Practicing Forgiveness - Set yourself free to move on. Stress Management - Handling the stress that comes with divorce. Anger Management - Find ways to overcome the anger and resentment. How Can I Handle My Anger - Get advice from the life coach. Building Self Esteem - Learning how to love and accept yourself again. Healing After Divorce - Consciously dealing with your emotions. Divorce Groups - Find local divorce support groups to help you get through your divorce and be surrounded by people who know what you are going through. To support you on your journey through crazy emotions and divorce ups and downs, I have found an excellent book that works on helping you create the happiness, fulfillment, and success that you desire. In fact, I've read "Today is Your Day to Win" twice. It's geared toward self-reflection and growth, packed with proven and practical success secrets to give you wisdom and encouragement, expanding your focus when the pressures of life closes in on you. As a special gift for our readers, you can now get "Today is Your Day to Win" for free.